Known for Manufacturer, Exporter an extensive assortment of high-quality, "N.B.M. Industries", was established in the year 2006. The product range offered by us is inclusive of Crane Accessories, Crane Current Collector, DSL Busbar System and more. These products offered by us are manufactured from finest quality raw materials, which are procured and sourced from certified & authorized vendors of the industry. By using sophisticated machines, tools, and equipment, our engineers precisely design these products in conformity with the industry set norms and regulations. Available with us at reasonable prices, these products are known for their durability, dimensional accuracy, and robust design. The product range offered by us is available in user-defined specifications. These products can be availed by our customers in bulk quantities owing to our large production capacity. Backed by a state-of-the-art, ultra-modern, sophisticated and advanced infrastructure, we have been able to cater to the needs of our valuable customers in an effective manner. To ensure high standards of quality, we have installed cutting-edge machines, tools, and equipment at our infrastructural facility that are required for standardized production. Moreover, we upgrade our infrastructure on a regular basis to ensure streamlined manufacturing, quality testing, loading and unloading applications. To effectively handle and manage different units of our infrastructural facility, we have appointed a team of machine operators, technicians, and other supporting staff. We export our products in UAE, UK, European countries etc. Established by our mentors, "Mr. Sanjay Maniar", we have been able to cater to a huge clientele across the globe. 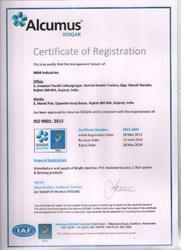 Owing to his experience, knowledge and management skills, we have gained a commendable position in this domain. Keeping in mind the convenience of our customers, we offer them multiple and easy modes of payment. 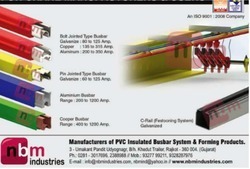 Manufacturing and Trading of Insulated Conductor Systems, C-Rail Festoon Systems and PVC Insulated Busbar. Backed and well-supported by a team of highly skilled and experienced professionals, we have been able to cater to the needs of our valuable customers in the most organized manner. Our employees hold expertise in their areas of operations and are appointed by our management after assessing their skills, knowledge, and experience. To ensure a hassle-free workplace, our employees work hand in hand with each other. Well-versed with their respective domains, our manpower works in close coordination with each other. Further, we arrange regular training sessions for our team to keep them updated with the changing market dynamics. With the aid of ultra-modern infrastructure and a diligent workforce, we have been able to meet the ever-changing market trends in the most organized manner. Our employees follow client-oriented approach while interacting with the customers, to known their precise requirements. We provide customized solutions as per the requirements provided by the customers. The quality of our product range is never compromised and is attained at all times through various quality assurance procedures conducted at our sophisticated in-house quality testing unit. We have established a huge distribution network, for timely delivery of the offered range at the customers’ end.